Rights violations have continued unabated and unaddressed in Ukraine and people are still dying amid ongoing conflict between Government forces and armed separatists in the east of the country, a top UN rights official on 19 December 2018 said. IOM/Konstantin Skomorokh | An elderly woman in village Krymskoe, heavily affected by the armed conflict, receives financial assistance from IOM. Addressing Member States at the Human Rights Council in Geneva, Deputy High Commissioner for Human Rights, Kate Gilmore, warned that in addition to the loss of life, fighting had caused communities to “fracture”, undermining the prospects for a sustainable peace. 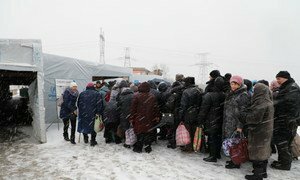 “We must acknowledge with deep regret that Ukraine is now in its fifth winter of conflict…that has caused a multiplicity of human rights violations, led irreversibly to loss of life, eroded human dignity and destroyed civilian infrastructure”, she said. In her update to the Human Rights Council – the 24th by the UN Office of the High Commissioner for Human Rights (OHCHR) – Ms Gilmore highlighted that 50 people had been either killed or injured in the latest three-month reporting period, from August to November. This is more than half the number of civilian deaths and injuries logged in the previous reporting period, Ms. Gilmore said, welcoming the reduction in fatalities and attributing it to the warring parties’ decision to recommit to a ceasefire in July and September. More than one in three casualties were caused by shelling or light weapons, she added, noting that Government forces were believed to have carried out the majority of incidents. Overall, of more than 200 abuses substantiated by interviews with victims and witnesses, the Government of Ukraine was alleged to have carried out 147 of them, Ms. Gilmore said. Responsibility for the remainder reportedly lay with non-State armed groups in Luhansk and Donetsk and the Russian Federation “as occupying power in Crimea”, the Deputy High Commissioner explained. In view of upcoming Presidential and Parliamentary elections in Ukraine, the Deputy High Commissioner also expressed concern at “continuing and increasingly violent attacks” against journalists, defence lawyers and civil rights bodies. These were perpetrated by extreme right-wing groups, Ms Gilmore insisted, noting that there had been 59 violations of freedom of expression, freedom of association, religion or belief from July to November; a 31 per cent increase since previous reporting period. In reference to the Ukrainian sailors still held in Russia after an incident off Crimea’s Kerch Strait last month, the Deputy High Commissioner appealed for the crew to be given “regular, unimpeded and confidential access to their lawyers”. She also said that the Ukrainian Government’s decision to implement Marshall Law in 10 regions for one month must also be “limited to what is necessary”, before welcoming the recent transfer of 55 pre-conflict prisoners from territory controlled by the self-proclaimed Donetsk and Luhansk “people’s republics”. The Ukrainian authorities should also protect people’s freedom of religion or belief, Ms Gilmore insisted finally, following the recent decision by hierarchs of different Orthodox denominations to establish a new Orthodox church in Ukraine. (SOURCE: UN News).